We would like to thank Mike Lovatt (formerly Wadsworth) of Southport for his indispensable help in compiling this account of his grandfather's life. Mike has also supplied two photos which we are very glad to be able to use here. At his attestation on 24th December 1914 in Grove Park, London, Percy and his family were living in High Street Stokesley. Percy was then a motor lorry driver. He was 5’ 9” tall with a 35 ½“ chest. His next of kin was his wife, Ann Ellen, of High Street, Stokesley. Their date of marriage was given as 13th October 1910 and they had 2 children - John born 22nd August 1911 and Mary born 31st October 1913. Both the marriage and the births had taken place in Blackpool and at some point Ann must have returned to Blackpool as her address was amended to 3 Egerton Road, Blackpool in Percy’s papers. This may have been only for the duration of the war as in 1923 a Lilian Laing (whose mother’s maiden name was Benson) was born in Stokesley. There also appear to be local marriages for some of the children. Percy’s time in the army was spent as either a motor lorry driver or staff car driver. He is recorded as a good driver, strictly sober, reliable, intelligent with a good aptitude for car and lorry driving. Percy was posted to France on 5th May 1915, and he seems to have served there continuously until his war effectively ended when he was wounded on 6th June 1918 Percy was hospitalised and returned to England on 13th June. He was declared no longer physically for war service on 2nd December 1918. By then, the war had been over for three weeks! Driver Laing was awarded the British War Medal, the Victory Medal, the 1914/15 Star and in addition the Silver War Badge in respect of his discharge as a wounded soldier. Percy's later life was not well known to us, but we have now received a photo and information about Percy's life from his grandson Mike Lovatt who tells us that in the years between the two world wars Percy ran a car hire/taxi business from the old Three Tuns Yard in Stokesley. (The former Three Tuns Inn is now the Eastern Spice restaurant). Outside his cottage (which later became the Stokesley Gallery), Percy also erected the first petrol pumps in Stokesley. These hand operated pumps drew up the fuel from tanks located beneath the pavement! Mike's mother Lily (see above - Lily is now 91 years old2) tells Mike that she well remembers cranking away at the pumps to fill gallon measuring cans which she then decanted into the fuel tanks of the customers' vehicles! Older residents may recall other sets of pumps in the High Street about which which Mike has written to us: one of these was outside Westbrook's Cycle Shop (facing what is now Uno Momento) and the others, which dispensed Esso fuel, on the opposite side of the road at Seppy Paxton's hardware shop (now Saks) which continued in operation up to the 1960's when Ken Draper was the proprietor. 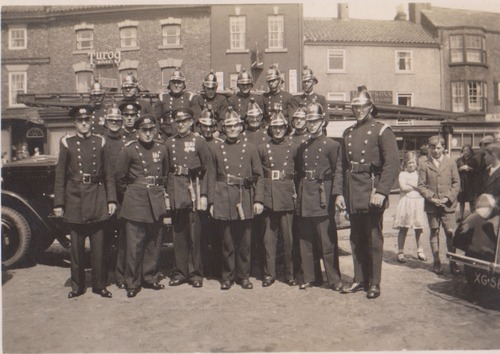 Mike further tells us that Percy was during this time one of the drivers of the Stokesley Fire Engine, and Mike has sent us this photo of the crew, taken in 1939. The engine is standing on the Plain, and behind it can be seen the west end of College Square, where the Y Thai restaurant now stands. Percy Laing appears third from the left in the front row, his uniform replete with his medals, his fire axe and rope. 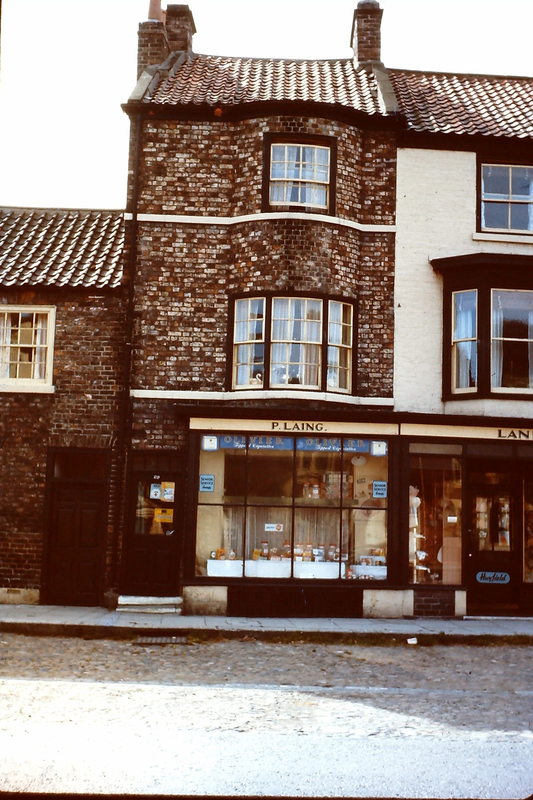 In the 1960's, Percy ran a grocery shop at 69 High Street which also sold sweets. The picture shown here was taken by Mike in about 1964, and local residents may also recognise Percy's neighbours, Lane's haberdashery store. Some time after this, Percy Laing moved away from Stokesley. He died in 1977 in Blackpool. 1 Mike Lovatt tells us that this census entry is incorrect, and he has his mother's word for the fact that Percy was born in Edinburgh, where his father was a stableman and driver. Percy came to Lancashire in his teens, where he met and married Ann Benson, who was independently wealthy. The mistake in the census possibly derives from Percy having worked in the Manchester area. James Laverick was born in 1881 in Busby the son of Horatio Henry Laverick , general labourer from Sheffield, and his wife Margaret Ann. In 1891 James was living with his parents and 3 siblings in Sowerby but by 1901 the family was living in Stokesley. In 1911 James was still living in Stokesley with his parents and 3 of his siblings. He was working as a compositor. James attested on 11th December 1915 in Stokesley. At this time he was aged 34 years and 1 month. He was still a compositor, and is recorded as married and living on College Square, Stokesley. His wife was named as his next of kin. At his medical examination in May 1915 he was described as 5’ 5” tall, 133lbs, and 36” chest. He was of good physical development and gave his religion as Wesleyan. James Laverick was posted to the 3rd Yorkshire Regiment on 18th June 1917 and embarked for France in October 1917. We are told nothing about the next few months of his career, but on 5th April 1919 he was discharged. (It was unusual for a married man of James's age to be retained so many months after the Armistice). Private Laverick was awarded the British War medal and the Victory Medal. (We are delighted to be able to show them on the left by courtesy of Adam Harland of Harland's Military Antiques -http://www.harlandmilitaryantiques.com/ - who has contributed several photos to this site as well as some original research material. We send our thanks to Adam for all his contributions). It appears from our research that James Laverick returned to Stokesley to live, as records show that he died in Stokesley in 1934 aged 52. 1 Alice was the daughter of George Dobson, a bricklayer born in Redcar, and Eliza (nee Headlam) born in Whitby. Eliza Headlam was also the mother of Reuben Headlam Dobson and cousin of James Headlam – see elsewhere in They also Served. Henry Hudson Leeman was born in Stokesley in 1896, the son of William Leeman a confectioner and baker, and his wife Elizabeth. His parents both originated from Stockton, but in 1901 Henry was living with his parents and 2 younger siblings in Oaklands Cottages, Stokesley. By 1911 however the whole family had moved to Darlington. Henry attested on 14th August 1914 when he was 17 years and 9 months old. His address was 42 Durham Terrace, Darlington and he was a clerk. He was 5’ 9” tall, with a 36” chest and weighed 11 stone. He was of good physical development. Henry was sent to France in November 1916 and then posted to Salonika. The record is silent on the details of his service until he was demobilised on 16th May 1919. He received the Victory and British medals. Henry re-joined the army on 1st September 1920 at which point he joined the 5th Territorial Force Battalion of the DLI (No 4439.102). He was then aged 26 years and 250 days, 5’ 9 ½ “ tall and weighed 149 lbs. He had a 38” chest, grey eyes, brown hair and a fair complexion. Henry was finally discharged on 31st August 1923 on completion of his service. He died in Nottingham in 1976. Michael may have only been in Stokesley for a short while. He was born in Ireland in 1886. His parents were possibly Walter and Bridget McNicholas, as in the 1901 census this would place Michael living with his parents and a brother named John (mentioned in attestation) in Co Mayo. In 1911, age 23 and single, he was working as a farm servant at Spite Hall Farm, Pinchinthorpe. 37 ½ “. His next of kin was his brother John who lived at Logcurry (Lochcurragh), Swineford, Co Mayo. He was posted to India in 1917 and in 1918 he was transferred to the Labour Corps as he had inflammation of the middle ear. His character was described as “good”. He was demobbed to Loch Curragh in June 1918. A Michael Mcnicholas botn about 1887 died in 1944 in Swineford, Co Mayo. George Wilfred Morley (known as Wilfred) was born in 1898 in Stokesley, the son of George William Morley, a farmer labourer born in Middlesbrough, and his wife Elizabeth Jane (nee Appleton, born Stokesley). In 1901 he was living with his parents, 2 older siblings and one younger in a cottage at Viewley Hill, Coulby Newham. His father must have been working away from home when the 1911 census was taken as he is not listed in the household, but Wilfred and the rest of the family were living on Beck Side, Stokesley. Wilfred attested on 3rd June 1916 at the age of 18 years 1 month and 12 days. His address was given as Leven Terrace, Stokesley and he was a labourer. His next of kin was his father of Seamer Farm. Wilfred was placed in the army reserve and at a later medical when he was aged 18years and 9 months he was recorded as 5’ 5¼" tall with a 36 “ chest. He was posted as Driver to 411 Battery RFA on 22nd June 1917 and went to France 17th March 1918. He was thus in France during the dangerous times of the final desperate German offensives of the spring when the RFA were in constant action but his records do not tell us about any actions that he may have experienced. Wifred was demobilised on 21st Jan 1919. He received the British War Medal and the Victory Medal. George Morton was born in July 1882 in Great Broughton, the son of Matthew Morton, farm servant, and his wife Mary Jane. In 1891 he was living with his parents and 2 older brothers at the Farm House, Ingleby Greenhow where his father was a farm servant and his mother was housekeeper to John Humphrey, farmer. By 1901 he had left home and was a boarder on a farm in Nunthorpe where he was a horseman. John Richard (born 2nd July 1907); George Frederick, (15th Nov 1911); Harry Carter, (1st April 1914) and Kate (29th Feb 1916). George remained “at home” until 14th September 1916 when he was posted to France, at which time he was with 2 Battalion Yorkshire Regiment. George was therefore present during the latter stages of the disastrous Somme offensive. On 12th November 1917 he was posted to Italy and was transferred to 9 Battalion Yorkshire Regiment. George then returned to France on 18th September 1918 where he remained, apart from 2 weeks leave, until 16th July 1919. On his return to England he was with 37 POW Company. He was discharged on 23rd September 1919. at the age of 37 years. George was awarded the British Medal and the Victory Medal. Something about army life must have appealed to George, as he later re-enlisted in 4th Yorkshire Regiment Territorial Force, and his medical examination of 1920 tells us that he was then 37 years old, 5’ 8 ½“ tall with a 38" chest and weighed 146 lbs. He had dark brown hair, brown eyes and a fresh complexion. At this time George was working as a miner. He was finally discharged in the following year. George and Alice's family continued to grow after the war, with the births of Ada, May, and Matthew. Ada – one of twins - married Harry Shore and at the time of this research they were still living in Stokesley! (According to various Morton family trees George and Alice had 8 children in total. Joseph Robert Mudd was the older brother of Henry Farrow Mudd (see The Fallen) and was born in 1893 in Stokesley. In 1901 he was living in Stokesley with his 3 siblings and his widowed mother, a draper. The census of 1911 records that he was apprentice to John Wilfred Kitching (see above). Joseph married Annie Elizabeth Wilson in 1914 in Stokesley and they had a daughter, Olive, in 1915. His military service records do not seem to have survived, but according to the Absent Voters list of 1918, John's home address was North Road, Stokesley, and he was a Private (no, 31151) in the AVC. 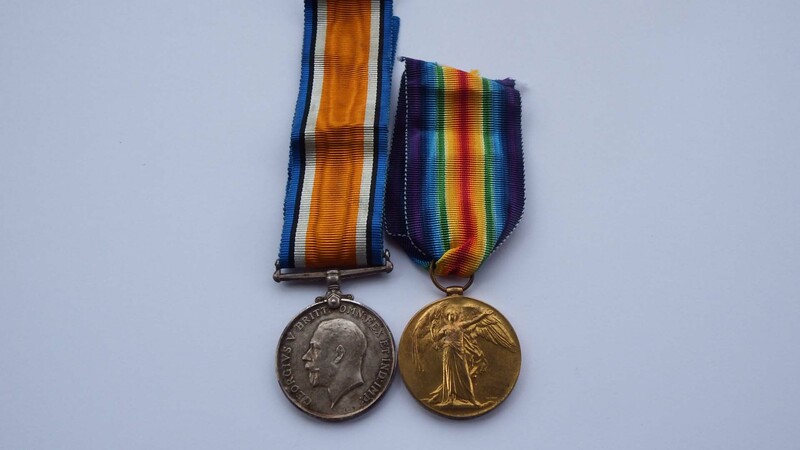 However, a Medal Roll exists which lists Driver Joseph Robert Mudd as a member of the Royal Field Artillery, with the regimental number 110895 and states his entitlement to the British War Medal and the Victory Medal. This is proof that Joseph served overseas, though whether he was a Driver in the RFA before he joined the AVC or vice versa is impossible to determine. (The date on the Medal Roll (1920) is the date on which the list was drawn up, and does not indicate that he was still in the unit). Joseph returned to the area after the war, and lived until 29th December 1955. He dies at 29 Leven Street, Saltburn. Administration was granted to his widow, Annie Elizabeth. Walter Nichols was born in Great Broughton in 1883, the son of William Nichols (a bricklayer from Nunthorpe) and his wife Mary (from Manchester). In 1891 Walter was living with his parents and older sister in Holme, Great Broughton. However, by 1901 Walter was living in Wrightson’s Yard, Stokesley with his parents and his uncle. Walter was working as a groom. In 1906 Walter married Gwendoline Nichols from Great Ayton (her family had spent some time in Scotland) and in 1911 Walter and Gwendoline were living in Levenside with their 2 young children, Gwendoline and Hughie (Walter Hugh). Walter senior was now described as an insurance agent. It seems that they had 3 further children between 1912 and 1921 – Maurice, Muriel and Audrey. Walter's service records appear to have been lost, but we learn from the 1918 Absent Voters list that he was then in the Army Veterinary Corps (AVC) as Private SE29313 and that the family lived on South Side in the town. We also have Walter’s medal card, which shows that he received the British War Medal and the Victory Medal. This shows that Walter served overseas, and the prefix SE to his regimental number means “special enlistment” which in the AVC was applied to men whose specific task was to look after and manage horses. Such soldiers were usually drawn from an agricultural or equine handling background. Walter returned to the area, and the last of his children (to our Knowledge was born in 1921. Walter appears appears to have lived until 1948. George Peacock was born in 1879 at Hutton Rudby (according to his statements to the army doctor when he enlisted). He was the son of Miles Peacock, butcher, and his wife Margaret (nee Sturdy) who had married in Stokesley district in 1873. We first find them together in Census returns in 1881, when George is living with his parents and 3 older brothers in Cemetery Road. Linthorpe. Ten years later (1891) the family was in College Square, Stokesley. Miles was then working as a farm labourer, and George had two younger sisters. Research has failed to locate George's whereabouts thereafter until he joined the army at Stokesley on 30th August 1916, when he gave his age as 37 years and 11 months, and his address as South Broughton. His occupation was cow keeper and he listed his mother as next of kin. George was then just under 5' 5" tall and weighed 11 stone, with good physical development evidenced by a 38" chest measurement. The army doctor listed George's teeth as defective, but passed him fit for service. George joined the Royal Field Artillery, but spent more than a year in England training. He was posted as Driver 205369 on 2nd February 1917 and mobilised on 2nd August following, finally being posted to the Western Front on 28th November,1917, where he would have faced the final German assaults of Spring 1918. The end of George's army career is strange in that he was sent home on leave in the middle of December, 1918, (after hostilities had concluded). He was apparently told he had to await further instructions but confusion then arose over what he should do at the end of the leave. For one reason or another, George spent Christmas 1918 at home, and there followed a correspondence over whether and when and where he should rejoin his unit! The army authorities even asked the local police sergeant to confirm that George was at his home address, but made it clear under no circumstances was he to be arrested! In the end, George was demobilised whilst still on leave on 4th February 1919. Driver Peacock was awarded the British War Medal and the Victory Medal for his service. George later married Florence Reed in Stokesley District in 1925, and they had a son called Maurice. George seems to have died in 1947, and although his son Maurice has also passed away, Maurice's own threee children still live locally. John William Peacock was born in 1898 in Stokesley, the son of John William Peacock, a busman (omnibus), and Ada his wife. In 1901 he was living with his parents and 3 siblings at South Side, Stokesley. In the 1911 census their address was given as Beckside and the number of siblings had grown to 4 sisters and 5 brothers! John attested on 10th Dec 1915 when he was 18 years and 3 months old. He was a farm horseman and named his father as next of kin. He was placed in the reserves until Jan 1917 when he was mobilised and posted to No 1 Depot. At this time he was described as 5’ 4 ¾ “ with a 35” chest and weighing 113 lbs. He had good physical development. He was sent to France in January 1918. We know nothing about his actions in the war itself, but he was retained under the colours long enough to be part of the army of occupation, as we have his ID card which in 1919 shows that he was with B/74 Brigade RFA, and his theatre of War was the Rhine. His medical category was listed as A1. John William Peacock received the British War Medal and the Victory Medal. We also know that he returned to Stokesley and married Amy Allinson in 1919. He lived on until 1969. William Peacock's birth was registered in 1870 in Stokesley. In the census of the following year, he was recorded as 11 months old, living with his widowed mother Sarah and four older siblings in South Street, Stokesley. Ten years later, the family were in South side but Sarah, again recorded as a widow, had two additional children, Henry and Frederick. In 1891, the family is still together, living close to the Black Horse Inn, where William Exelby senior was landlord. (See Exelby above). The male members of the household were listed as general labourers. William continued to live with his mother until her death in 1907, but in 1911, William was recorded as a cowman living and working on Tanton Farm, which was owned by Mary Pearson, 71, widow. William's attestation is dated 30th October, 1915, a document countersigned by Sam Wiggins, JP, the Stokesley brewer. William, whose address at this time was given simply as Stokesley became Private 5267 Peacock in the 4th Yorkshire Regiment. In his medical examination at Northallerton on 1st November, 1915, William was of 'apparent age 40 years' (he was actually 45), 5'9" tall, with a 36.5" chest. His eyesight was imperfect and his physical development 'fair'. He was passed as fit and posted to 3/4th Battalion, (Territorial Force). He served only in Britain, and was in Clacton on Sea in August 1916. However, William was discharged on 7th September, 1916 as 'no longer physically fit for war service'. He had complained of being unable to perform his duties due to swellings in his feet, ankles and knees. The doctor diagnosed myalgia, and stated that as William had a history of quite serious ailments prior to joining up, his condition was not due to his military service, and William's pension claim was subsequently rejected. A possible anomaly arises from a statement in his discharge document that William's next of kin was Henry Peacock, father, of High Green Stokesley. In fact, this Henry was William's younger brother! - Henry and his wife Emily are recorded as living in College Square in the 1911 Census. (As William's parents were both dead, Henry could in fact have been next of kin. The statement of relationship is most likely a scribal error, especially as later in the same document William's parents are listed as 'William and Sarah Peacock, both deceased'). Strangely, perhaps, William rejoined the Territorials on 3rd July 1920, giving his address as Market Place Stokesley. Bizarrely, he gave his date of birth as Chjristmas Day, 1876, (as there is no equivalent registration record this was undoubtedly a falsehood)) and he stated that he was single and a farm labourer. At his medical examination William was described as of 'apparent age 43 years 7 months (he was actually 50) and 5' 73/4" tall. He weighed 147 lbs, had a 38" chest and was of sallow complexion with brown eyes and 'greyish' hair. It was noted that his eyesight was 'only fair'. William signed for one year, citing his previous service and his former regimental number on his attestation. He was given the new regimental number of 4381517, and attended annual training from 31st July to 14th August, 1920; he was discharged on 2nd July 1921 on conclusion of his term of engagement. His character was recorded as good, and at this time his elder brother John of Market Place Stokesley was listed as his next of kin. A death is recorded for a William Peacock aged 78 in 1948 in the Cleveland district. If this is 'our' William, he did actually know his real age, and probably lied about it in his attestations. It is well known that many young men added years to their age so as to be eligible to serve. William was one of several Stokesley men who subtracted years from their age for the same reason! Harry Percival was born in Barnard Castle in 1885, the son of James Percival, a farm hind, and his wife Margaret. In 1891 Harry was living in Barnard Castle with his parents and 3 older siblings, but in the census of 1901 he was in Gilling working as a ploughman. Harry Percival married Margaret Smith in Darlington in 1908, and in the 1911 census they appear living in Leven Terrace, Stokesley, with 2 young children, Gladys Elizabeth and Elsie Margaret. Harry was a railway contractor’s labourer. They had 3 further children between 1913 and 1921- Norman Henry, Ernest Kitchener and Ethel Mary. Harry's military service records seem not to have survived, but the Absent Voters list of 1918 tells us that he was in the Army Service Corps (ASC) and gives his rank and regimental number as Driver T3/027118. The prefix T3 means that he was in the horse transport section. The Medal Roll for the ASC shows that Harry received the British War Medal and the Victory Medal, which shows that he served overseas, but so far we have learned no more about his service career. We can be certain that Harry came back to Stokesley after the war, and we know that he lived until 1951, when he died in his Levenside home. Administration was granted to his daughter Elsie Margaret Jones. (Elsie had married Harold Jones in Manchester in 1936).